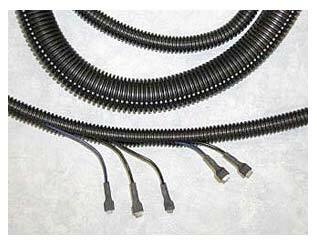 Slit Guard Conduit is an easy to use protection for wire, cable and hoses. Its full length slit down the side allows quick installation of your assembly but because of its unique corrugated design also closes for a permanent covering. General purpose polyethylene (BD72P) is used for bundling applications where temperatures are not a concern. It is also available in a gray flame retardant version. Nylon Slit Guard Conduit (BD71N) is a copolymer nylon type 6, providing good impact strength, elongation and flexibility. It is best suited for under hood, near brakes and other hot spots up to 300°F. Polypropylene Slit Guard Conduit (BD73PP) gives the added flexibility to allow sharp bends in tight areas and is available in a UL-94 V2 rated material.